I am delighted to report that recently I’ve been getting lots of compliments about my level of Danish from my wife’s friends and family here in Denmark. The secret to my Danish language learning is a massive focus on consistency. That’s it. Just doing something every day with Danish, and making a habit out of it. You can also see my efforts in this from how often I update this blog – here’s a graph showing how my blog posting went from being irregular to consistently publishing something every week. While I am waiting for the results from my written Danish test I thought I’d write about how I used Duolingo to help me prepare. I love Duolingo. Really I do. But when you reach the later intermediate levels in a language, it can become a comfort thing. You get tricked into feeling like you are making progress, but really you could be doing so much more with your time. I would consider myself something of a Duolingo evangelist, so these thoughts were blasphemous! I’m still convinced that Duolingo is a brilliant tool, particularly in the early days of learning a language. But once you have completed your Duolingo tree, and regolded it (which takes almost as long as the original tree!) then I think it is a sign to move on. Or in my case, severely cut back how much you use Duolingo. I have decided to adjust my Duolingo level to a ‘casual’ 10xp per day. My Danish tree will not stay gold for long, and I’m ok with that: the knowledge is still in my head. Right now it is getting back its colour and I am getting more confident with myself as an independent language learner. I may have lost my Duolingo streak, but I have not lost my determination to learn Danish. 100 Days of Duolingo! 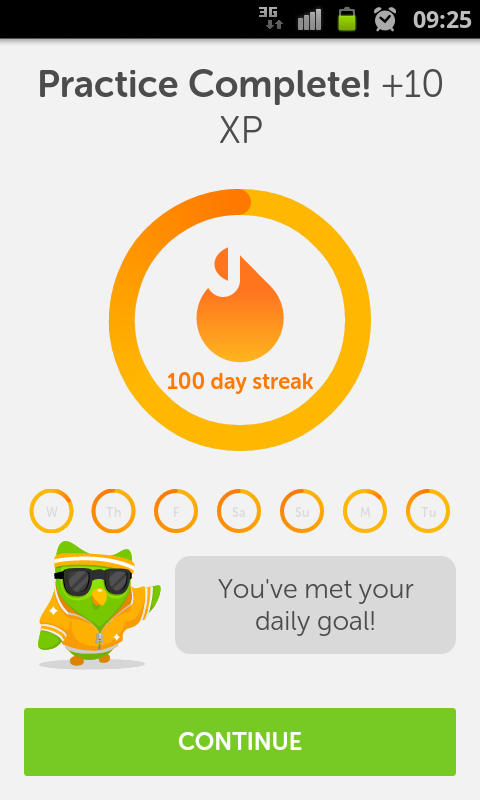 How I finally managed to achieve that elusive 100 day streak! 100 days! What a milestone! 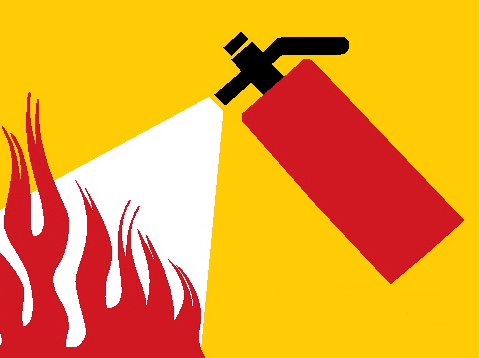 I have mentioned about woeful tales of losing Duolingo streaks in the past on this blog, but I finally found a way to overcome this obstacle. Allow me to provide a bit of context. At the moment I am working as a teaching assistant in an international preschool here in Copenhagen. I work with 3-4 year olds and provide them with English immersion through guided play and structured academic activities. During a guided play session, there were kitchen toys being used in one area, and toy animals used in another area. A child offered me a cup of ‘coffee’, and as I was pretending to drink it, another child came along with a toy dinosaur and mimed as if it was drinking out of the cup. Suddenly the dinosaur was drinking my coffee. I guess it just goes to show that sometimes the crazy sentences on Duolingo could possibly have a use… it’s just that it is extremely unlikely! Recently I finished my Danish Duolingo skill tree, and I thought I’d write an update on how I’m using duolingo these days. It is finally beginning to get easier to do Duolingo now, because I am a lot more familiar with Danish vocabulary and use of the language. At the moment, I’m just trying to use the ‘practise skills’ button until all of the skills in my skill tree are gold. 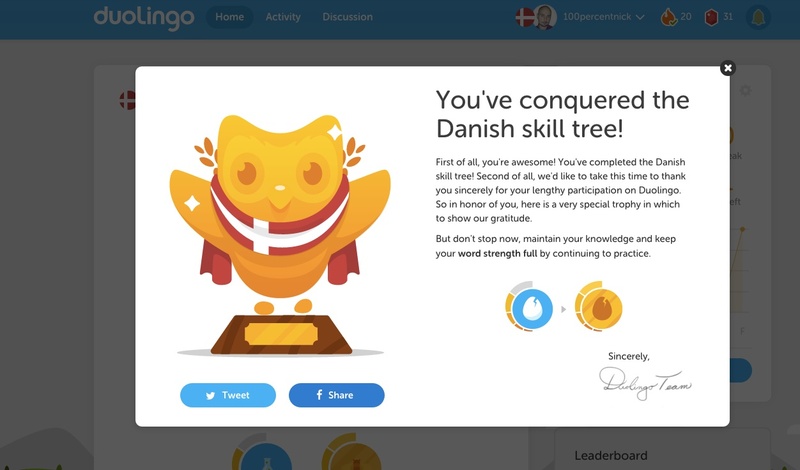 I finished my Danish Duolingo Skill Tree! Although I’ve written about Duolingo a fair bit on this blog, I’ve never actually completed any of the skill trees. Until Now! I started the Danish course on Duolingo last year, and it is something that I’ve been slowly working on ever since then. I’ve heard about the famous ‘golden owl’ reward that you get for completing a skill tree, and now I’ve finally got one! It was late. She desperately made her excuses and promptly left her friend’s house. On the way home, she realised that she wouldn’t make it back to her house before midnight. It wasn’t specifically the house she was in a rush to get back to: it was the stable wireless internet connection there. Reluctantly, she pulled over in her car, fumbled around for her android phone and hastily booted up the duolingo smartphone app. Precious moments later, the all too familiar trumpeting chime signalled that she was out of hearts. It had gone past midnight. She had lost her 177 day duolingo streak.